This article presents photos of Missouri’s Ozark National Scenic Riverways Quarter, the third of this year’s five coins from the U.S. Mint’s program of America the Beautiful Quarters®. 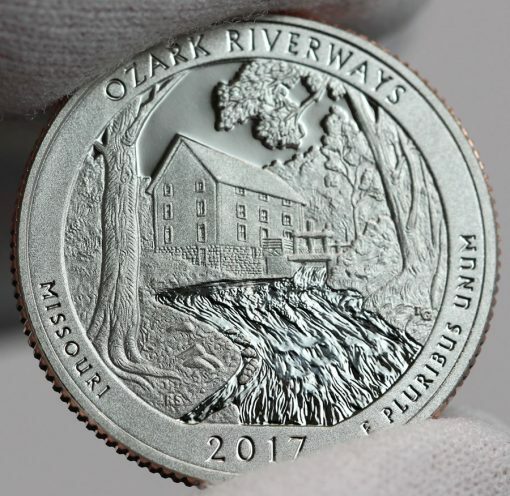 A series of coin events kick off in June for Ozark National Scenic Riverways, the first national park to protect a river system. 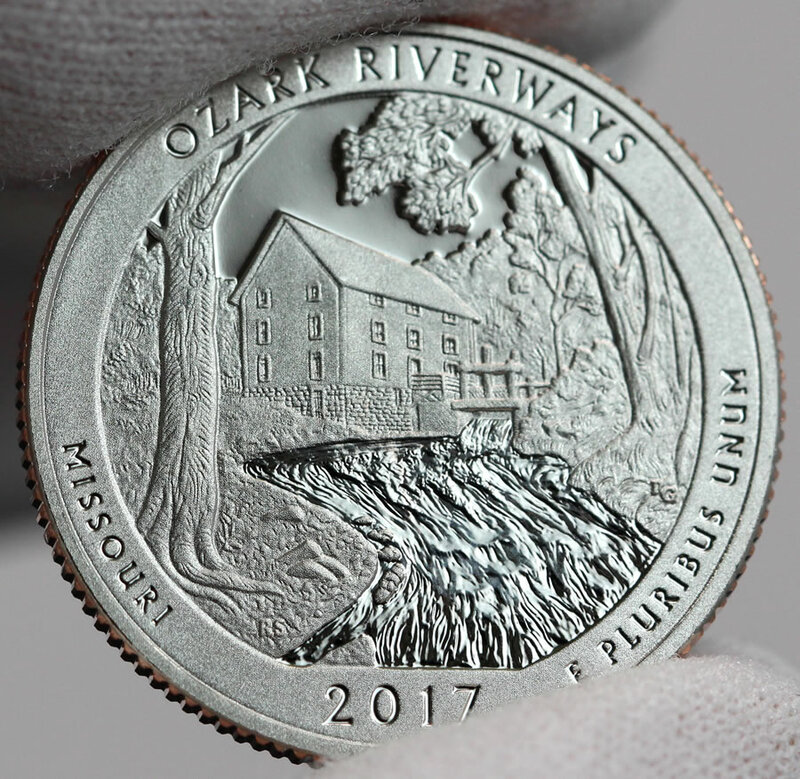 Early on Monday, June 5, the quarter commemorating the site gets released into circulation. 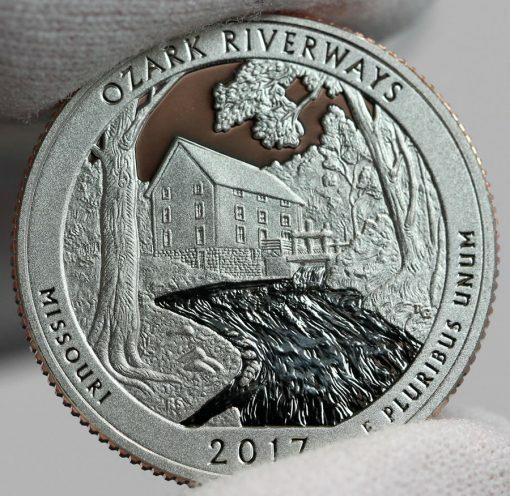 Two things happen at noon ET on the same day — the United States Mint begins selling circulating-quality Ozark Riverways quarters and officials from the U.S. Mint and National Park Service introduce the quarter in a ceremony at Alley Spring and Mill on State Route 106 in Eminence, Missouri. 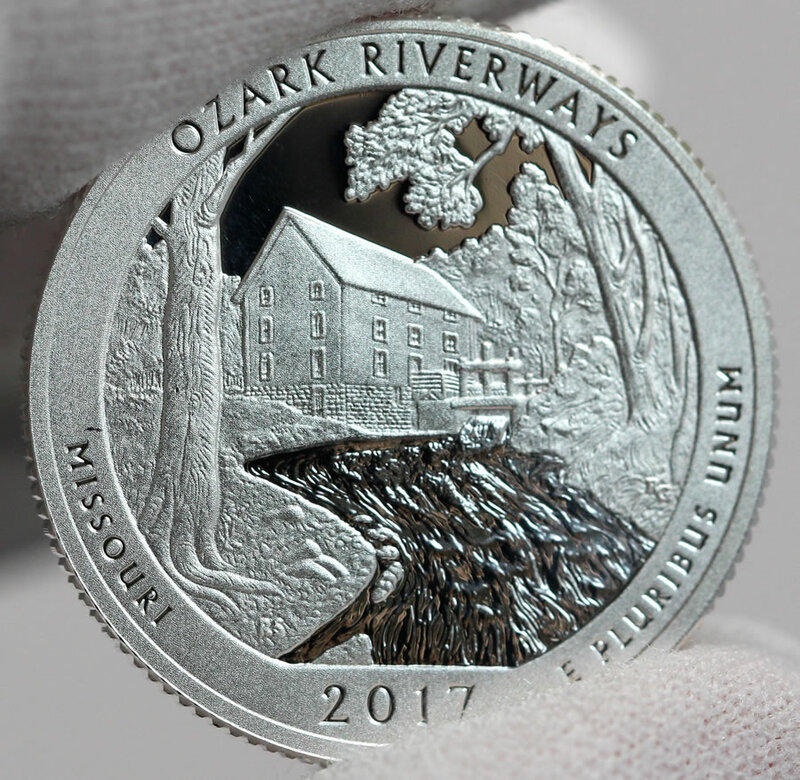 To offer a better look at the Ozark National Scenic Riverways quarter, we photographed several proof and uncirculated versions and share them now. 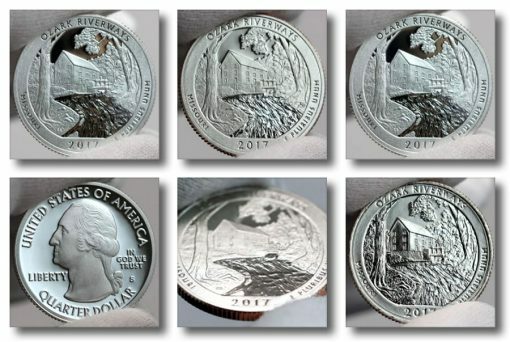 Obverses (heads) are common to all quarters, showcasing the 1932 portrait of George Washington by John Flanagan. America the Beautiful Quarter reverses are emblematic of the site they honor. The quarter for Missouri is the 38th issue in the ATB series and the third of five for 2017. 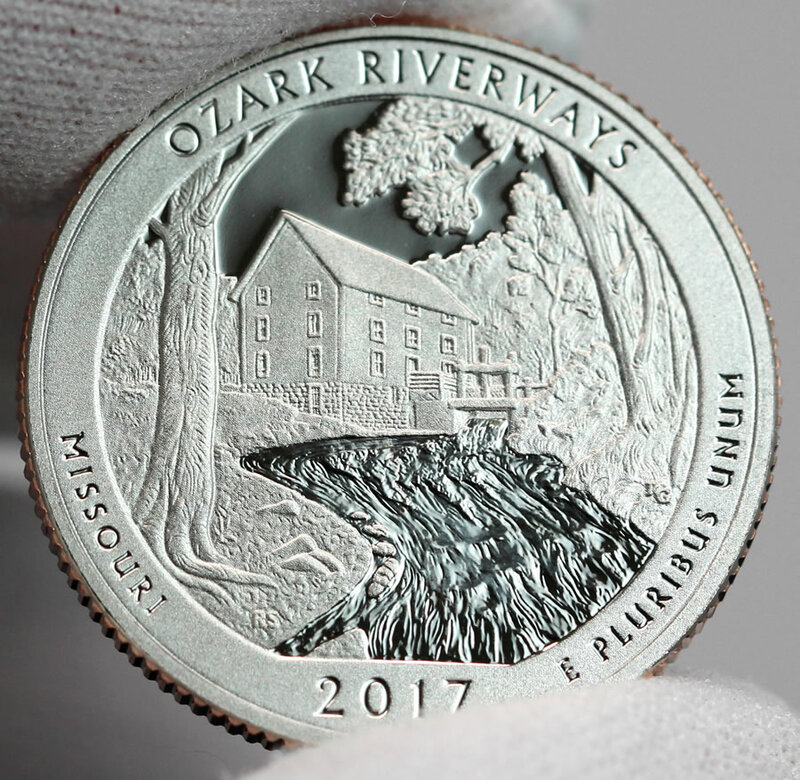 Designed by Ron Sanders and sculpted by Renata Gordon, the Ozark Riverways quarter depicts depicts Alley Mill, a steel roller mill built in 1894. This merchant mill was used to convert wheat into flour. It was selected after some refinements following a review of 9 candidate designs. Inscribed around the design are OZARK RIVERWARYS, MISSOURI, 2017, and E PLURIBUS UNUM. These next photos are grouped by their quality and compositions. 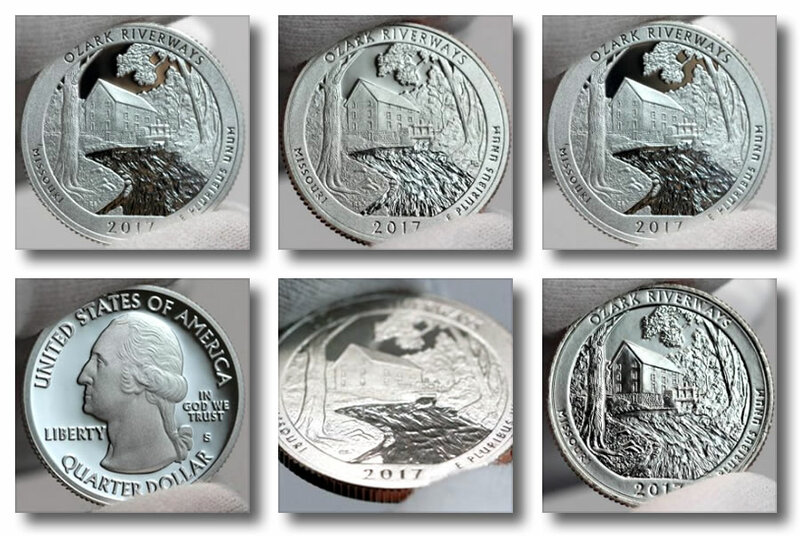 These photos show a silver proof quarter. The Mint’s silver coins for numismatic proof sets are composed of 90% silver and 10% copper. At a glance, it can be difficult to tell the difference between a clad and silver proof quarter because they have the same finish and diameter of 24.26 mm. 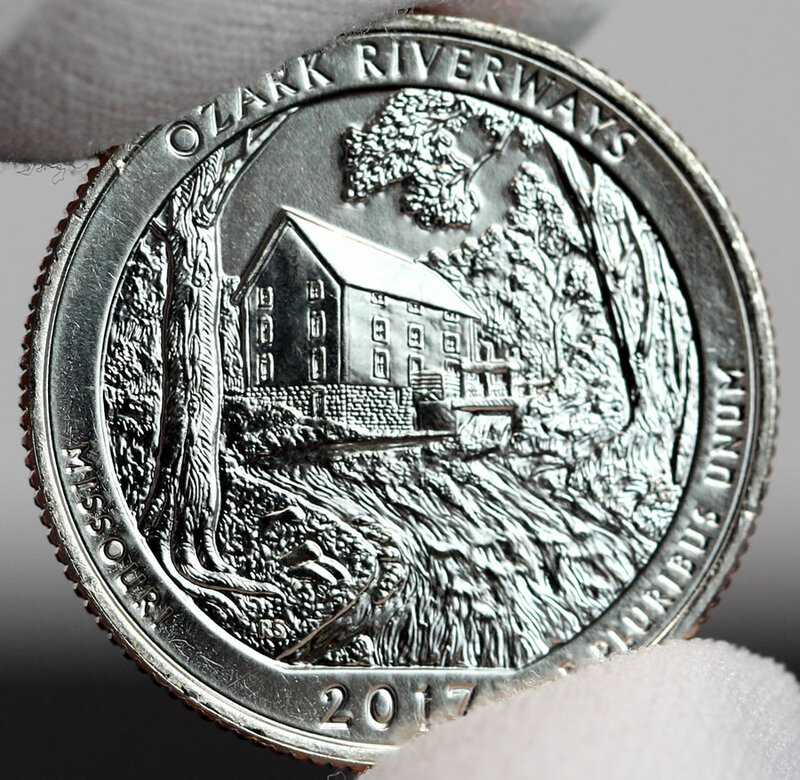 Quarters in silver do weigh more at 6.250 grams compared to clad quarters at 5.670 grams. 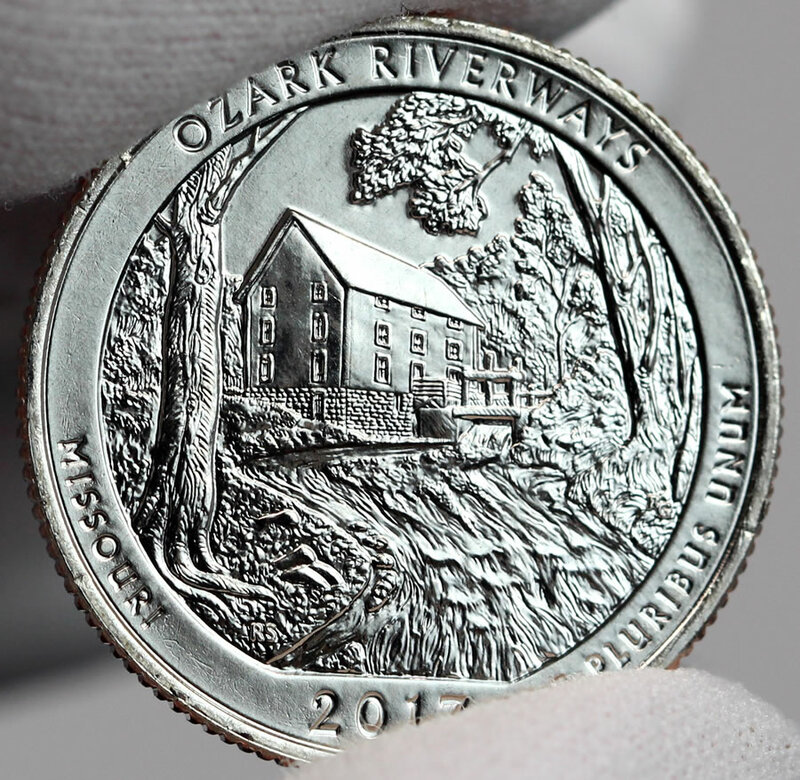 Uncirculated quarters look most like those found in circulation, featuring the same specifications. Special care is used in making them, so they tend to offer sharper looking designs and have a stronger brilliant finish. 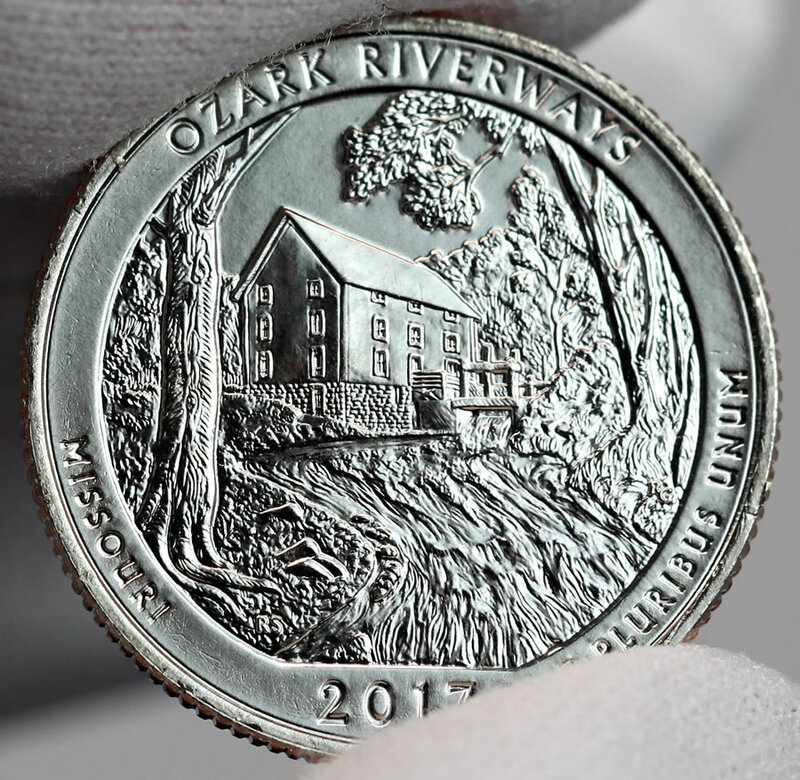 Uncirculated quarters are made at the Denver and Philadelphia Mints. 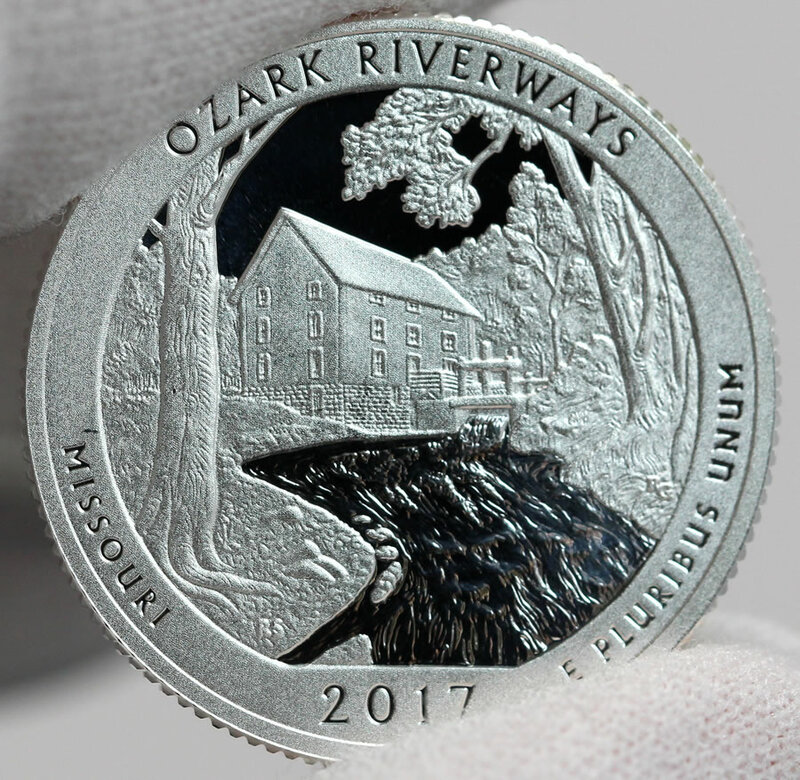 The other four 2017 quarters depict Effigy Mounds National Monument in Iowa, Frederick Douglass National Historic Site in Washington, D.C., Ellis Island (Statue of Liberty National Monument) in New Jersey, and George Rogers Clark National Historical Park in Indiana. Lots of detail on this coin. The river looks a little phony though.